Record album The 9th MBC Riverside Song Festival : Record album The 9th MBC Riverside Song Festival 을 보여줍니다. Since its inception in 1979, the Riverside Song Festival, coupled with the Campus Song Festival, was a representative youth music competition in the 1980s. Starting with the first competition held in Cheongpyeong Recreation Area in Gapyeong-gun, Gyeonggi-do, in 1979, the song festival has been held in various places, including Cheongpyeong, Namiseom Island and Chuncheon-si, between July and August each year. Music competitions for college and university students were considered one of mainstays of Korean youth culture since the 1970s, then reached their peak in the 1980s and gradually lost popularity as the Korean pop music industry was reorganized centering on entertainment agencies in the 1990s. As this situation continued, the Riverside Song Festival, which reflected the fresh sentiments and vigor of young people while serving as a gateway for new singers, was discontinued with the 22nd contest in 2001. The competition produced a number of now-famous musicians, including Lee Sun-hee, Lee Sang-eun, Choo Hyun-mi, Park Mi-kyung, Lee Sang-woo and Park Sung-shin. The 9th MBC Riverside Song Festival took place with the participation of 12 teams on Namiseom Island on August 6, 1988. Lee Sang-eun won the grand prize with the song “Damdadi.” The gold prize went to Lee Sang-woo, who sang “Love Like a Sad Picture,” the silver prize to Lee Jung-a with the song “After You Left,” the bronze prize to the group Sonagi with the song “Rain Shower,” and the participation and vocals prizes to Park Sung-shin, who sang “Rainy Afternoon.” The grand prize winning singer Lee Sang-eun drew critical acclaim as a rising star with the potential of becoming a top musician, and received a lot of media attention. The record album contains a total of 12 songs: the grand prize winning song ”Damdadi,” the bronze prize winning song “Rain Shower,” the participation award winning song “Rainy Afternoon,” “Where You Left,” “Losing Memory” and “Love of Seagull” on side A, and the gold prize winning song “Love Like a Sad Picture,” the silver prize winning song “After You Left,” “After the Day,” “My Youth is Thirsty,” “In This Night” and “In the Starlight” on side B. 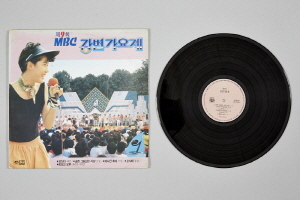 This album, released by Jigu Record, presents one aspect of the Korean pop music history of song contests for college and university students in the 1980s. 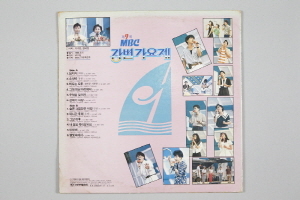 This is a record album containing the award-winning songs and entries of the 9th MBC Riverside Song Festival in 1988.